Another new release for Autumn/Winter 2009 is Urban Decay’s new Ink For Eyes, a highly pigmented cream liner available in 6 different colours for the party season! I received 3 of the latest shades to try out and share my thoughts with you. You can achieve good precision with the brush end and the smudger is as good as anything I own to create a smokier look. 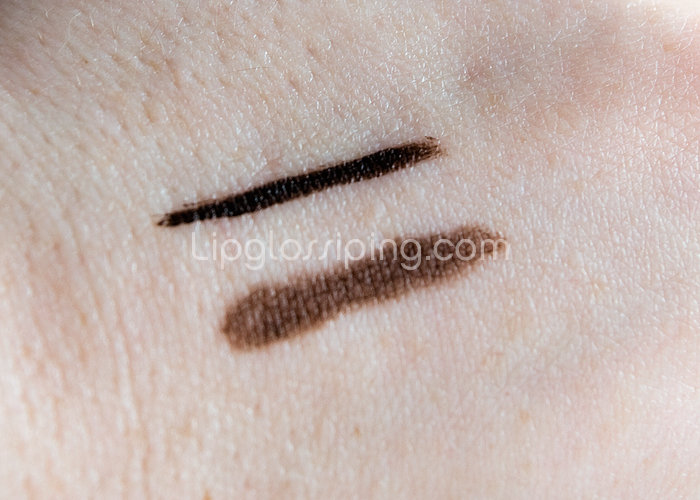 Here’s a swatch of the brown.. check out that pigmentation! 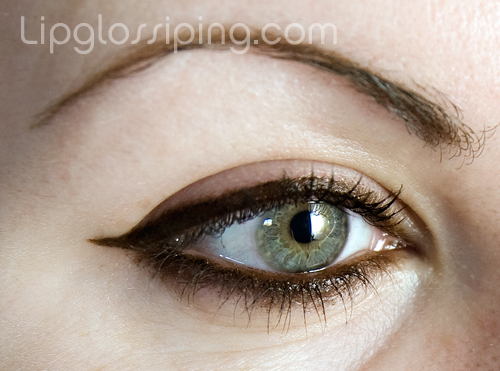 The top line shows 2 swipes of the liner whilst the bottom line is 1 swipe and then smudged out using the smudger tip. The product applies smoothly with absolutely no drag on the eyelid I’m pleased to report. There’s nothing worse than a product which is too hard and drags on the delicate skin… my pet hate for any liner! Here, I’ve lined the top and bottom lashlines fairly heavily (for a night-time look) and I’ve smoked out the lower for a more sultry effect. This is where the product excels… I LOVE this liner for a smokier/smudgier ‘rock chick’ look. It also works well as a cream eyeshadow when smudged gently over the upper lid… it blends beautifully. 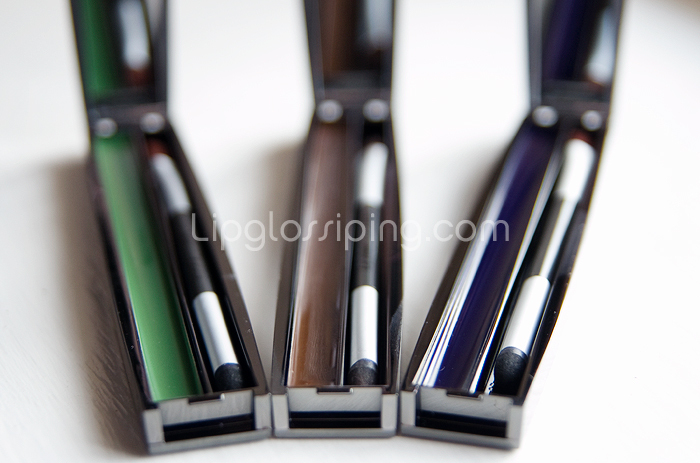 If you’re a fan of these kind of liners… then I don’t see how these could fail to please! Beautifully packaged with a decent brush and useful mirror, whilst the product itself is nicely pigmented and very soft, creamy and easy to apply. My only gripe with the Urban Decay Ink For Eyes is the same gripe I have with a lot of cream liners. Transfer. This doesn’t set too well. I’d recommend a touch of translucent powder or eyeshadow in a similar shade to limit transfer on your mobile lids (especially if you have hooded eyelids like me). 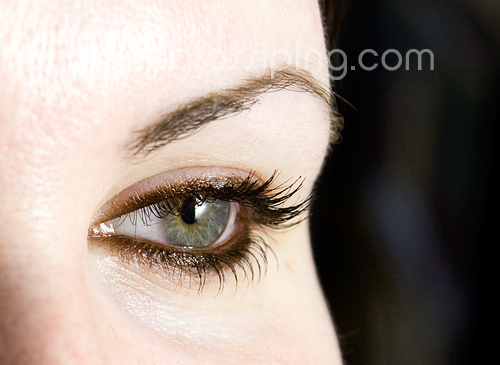 Having said that, once smudged out a bit… I had no problems with further smudging or transfer on the lower lashline. 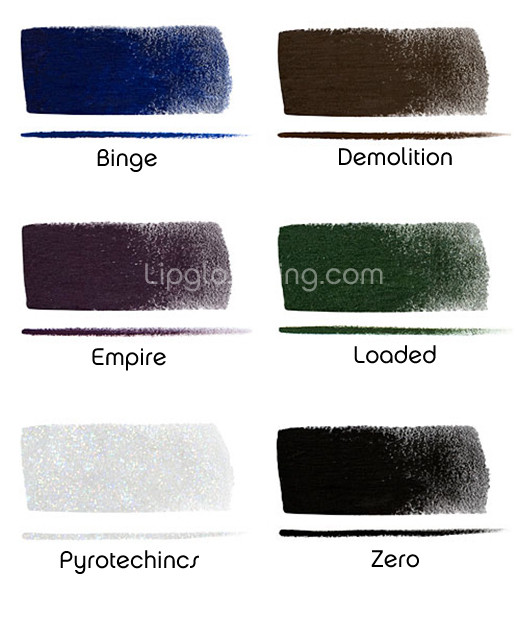 Colour-wise, I’m really tempted by the eggplant shade (Empire) for some gorgeous smoky Autumnal looks, which shade is your favourite? 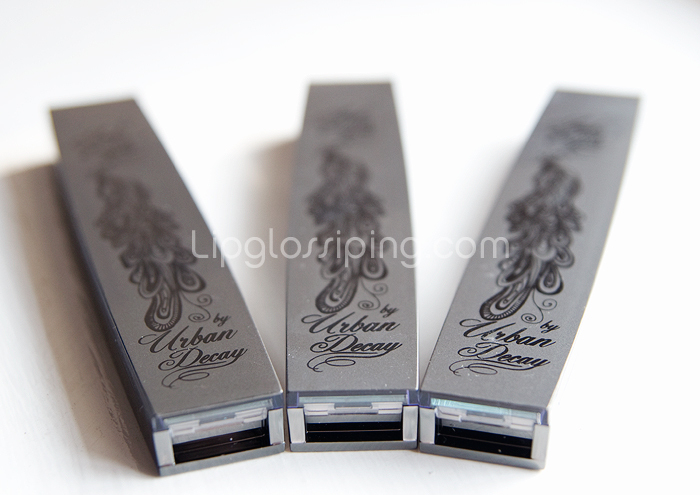 Available from the usual Urban Decay stockists and priced at £14 each. Awesome! I was totally trying to decide whether to get the black one or not. But maybe I’ll stray from the normal and get brown or something! How come you got to try out so much Urban Decay stuff you lucky duck! I’m seeing some very nice flicks there Missus, I’m liking the look of Binge, must resist temptation to buy more stuff. @Amanda – I often go for brown as I wear so many neutral eyeshadow shades that black often looks a bit harsh. Plus brown’s gotta be a good choice for Autumn/Fall right? Thanks for stopping by! @Rhamnousia – heeeee! What you can’t see is that the angle of the other flick is completely different… I looked wonkey eyed! They all look great, saw them in my local Boots on Monday but decided to grab the Book of Shadows instead but may have to go back and get a couple of these, since they are gorgeous. @Vicki – Hey! Oooh, I want to get that very badly! I have all my Advantage Card Points banked and ready to sacrifice themselves – but my Boots is teeny and doesn’t have any UD at all… I need to go into the city, by which time (no doubt) they’ll be sold out! I have indeed fiddled with the HTML on that thing but I think I may have to try and go back to how it was as others have said they can’t comment. Signing up to Twitter shall happen this evening as I’m doing bugger all really so look for a new follower tomorrow! I’m proud enough of you for getting one eye, once you get one, the other isn’t far behind! Wow, that brown looks incredible on your eyes!! !